Beryllium improves many physical properties when added as an alloying element to aluminium, copper (notably the alloy beryllium copper), iron and nickel. Beryllium does not form oxides until it reaches very high temperatures. Tools made of beryllium copper alloys are strong and hard and do not create sparks when they strike a steel surface. In structural applications, the combination of high flexural rigidity, thermal stability, thermal conductivity and low density (1.85 times that of water) make beryllium metal a desirable aerospace material for aircraft components, missiles, spacecraft, and satellites. Because of its low density and atomic mass, beryllium is relatively transparent to X-rays and other forms of ionizing radiation; therefore, it is the most common window material for X-ray equipment and components of particle detectors. The high thermal conductivities of beryllium and beryllium oxide have led to their use in thermal management applications. The commercial use of beryllium requires the use of appropriate dust control equipment and industrial controls at all times because of the toxicity of inhaled beryllium-containing dusts that can cause a chronic life-threatening allergic disease in some people called berylliosis. Beryllium is a steel gray and hard metal that is brittle at room temperature and has a close-packed hexagonal crystal structure. It has exceptional stiffness (Young's modulus 287 GPa) and a reasonably high melting point. The modulus of elasticity of beryllium is approximately 50% greater than that of steel. The combination of this modulus and a relatively low density results in an unusually fast sound conduction speed in beryllium – about 12.9 km/s at ambient conditions. Other significant properties are high specific heat (1925 J·kg−1·K−1) and thermal conductivity (216 W·m−1·K−1), which make beryllium the metal with the best heat dissipation characteristics per unit weight. In combination with the relatively low coefficient of linear thermal expansion (11.4×10−6 K−1), these characteristics result in a unique stability under conditions of thermal loading. Naturally occurring beryllium, save for slight contamination by the cosmogenic radioisotopes, is isotopically pure beryllium-9, which has a nuclear spin of 3/2. Beryllium has a large scattering cross section for high-energy neutrons, about 6 barns for energies above approximately 10 keV. Therefore, it works as a neutron reflector and neutron moderator, effectively slowing the neutrons to the thermal energy range of below 0.03 eV, where the total cross section is at least an order of magnitude lower – exact value strongly depends on the purity and size of the crystallites in the material. ទំព័រគំរូ:Nuclide + ទំព័រគំរូ:Nuclide → ទំព័រគំរូ:Nuclide + n , where ទំព័រគំរូ:Nuclide is an alpha particle and ទំព័រគំរូ:Nuclide is a carbon-12 nucleus. Beryllium also releases neutrons under bombardment by gamma rays. Thus, natural beryllium bombarded either by alphas or gammas from a suitable radioisotope is a key component of most radioisotope-powered nuclear reaction neutron sources for the laboratory production of free neutrons. Note that ទំព័រគំរូ:Nuclide has a half life of only 0.8 seconds, β− is an electron, and ទំព័រគំរូ:Nuclide has a high neutron absorption cross-section. Tritium is a radioisotope of concern in nuclear reactor waste streams. As a metal, beryllium is transparent to most wavelengths of X-rays and gamma rays, making it useful for the output windows of X-ray tubes and other such apparatus. Both stable and unstable isotopes of beryllium are created in stars, but the radioisotopes do not last long. It is believed that most of the stable beryllium in the universe was originally created in the interstellar medium when cosmic rays induced fission in heavier elements found in interstellar gas and dust. Primordial beryllium contains only one stable isotope, 9Be, and therefore beryllium is a monoisotopic element. Radioactive cosmogenic 10Be is produced in the atmosphere of the Earth by the cosmic ray spallation of oxygen. 10Be accumulates at the soil surface, where its relatively long half-life (1.36 million years) permits a long residence time before decaying to boron-10. Thus, 10Be and its daughter products are used to examine natural soil erosion, soil formation and the development of lateritic soils, and as a proxy for measurement of the variations in solar activity and the age of ice cores. The production of 10Be is inversely proportional to solar activity, because increased solar wind during periods of high solar activity decreases the flux of galactic cosmic rays that reach the Earth. Nuclear explosions also form 10Be by the reaction of fast neutrons with 13C in the carbon dioxide in air. This is one of the indicators of past activity at nuclear weapon test sites. The isotope 7Be (half-life 53 days) is also cosmogenic, and shows an atmospheric abundance linked to sunspots, much like 10Be. 8Be has a very short half-life of about 7×10−១៧ s that contributes to its significant cosmological role, as elements heavier than beryllium could not have been produced by nuclear fusion in the Big Bang. This is due to the lack of sufficient time during the Big Bang's nucleosynthesis phase to produce carbon by the fusion of 4He nuclei and the very low concentrations of available beryllium-8. The British astronomer Sir Fred Hoyle first showed that the energy levels of 8Be and 12C allow carbon production by the so-called triple-alpha process in helium-fueled stars where more nucleosynthesis time is available. This process allows carbon to be produced in stars, but not in the Big Bang. Star-created carbon (the basis of carbon-based life) is thus a component in the elements in the gas and dust ejected by AGB stars and supernovae (see also Big Bang nucleosynthesis), as well as the creation of all other elements with atomic numbers larger than that of carbon. The 2s electrons of beryllium may contribute to chemical bonding. Therefore, when 7Be decays by L-electron capture, it does so by taking electrons from its atomic orbitals that may be participating in bonding. This makes its decay rate dependent to a measurable degree upon its chemical surroundings – a rare occurrence in nuclear decay. The shortest-lived known isotope of beryllium is 13Be which decays through neutron emission. It has a half-life of 2.7 × 10−21 s. 6Be is also very short-lived with a half-life of 5.0 × 10−21 s. The exotic isotopes 11Be and 14Be are known to exhibit a nuclear halo. This phenomenon can be understood as the nuclei of 11Be and 14Be have, respectively, 1 and 4 neutrons orbiting substantially outside the classical Fermi 'waterdrop' model of the nucleus. The Sun has a concentration of 0.1 parts per billion (ppb) of beryllium. Beryllium has a concentration of 2 to 6 parts per million (ppm) in the Earth's crust. It is most concentrated in the soils, 6 ppm. Trace amounts of 9Be are found in the Earth's atmosphere. The concentration of beryllium in sea water is 0.2–0.6 parts per trillion. In stream water, however, beryllium is more abundant with a concentration of 0.1 ppb. Beryllium is found in over 100 minerals, but most are uncommon to rare. The more common beryllium containing minerals include: bertrandite (Be4Si2O7(OH)2), beryl (Al2Be3Si6O18), chrysoberyl (Al2BeO4) and phenakite (Be2SiO4). Precious forms of beryl are aquamarine, red beryl and emerald. The green color in gem-quality forms of beryl comes from varying amounts of chromium (about 2% for emerald). The two main ores of beryllium, beryl and bertrandite, are found in Argentina, Brazil, India, Madagascar, Russia and the United States. Total world reserves of beryllium ore are greater than 400,000 tonnes. Beryllium is a constituent of tobacco smoke. The extraction of beryllium from its compounds is a difficult process due to its high affinity for oxygen at elevated temperatures, and its ability to reduce water when its oxide film is removed. The United States, China and Kazakhstan are the only three countries involved in the industrial-scale extraction of beryllium. Beryllium is most commonly extracted from the mineral beryl, which is either sintered using an extraction agent or melted into a soluble mixture. The sintering process involves mixing beryl with sodium fluorosilicate and soda at ៧៧០ °C (១៤២០ °F) to form sodium fluoroberyllate, aluminium oxide and silicon dioxide. Beryllium hydroxide is precipitated from a solution of sodium fluoroberyllate and sodium hydroxide in water. Extraction of beryllium using the melt method involves grinding beryl into a powder and heating it to ១៦៥០ °C (៣០០០ °F). The melt is quickly cooled with water and then reheated ២៥០ ដល់ ៣០០ °C (៤៨២ ដល់៥៧២ °F) in concentrated sulfuric acid, mostly yielding beryllium sulfate and aluminium sulfate. Aqueous ammonia is then used to remove the aluminium and sulfur, leaving beryllium hydroxide. 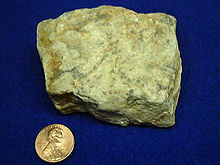 Beryllium hydroxide created using either the sinter or melt method is then converted into beryllium fluoride or beryllium chloride. To form the fluoride, aqueous ammonium hydrogen fluoride is added to beryllium hydroxide to yield a precipitate of ammonium tetrafluoroberyllate, which is heated to ១០០០ °C (១៨៣០ °F) to form beryllium fluoride. Heating the fluoride to ៩០០ °C (១៦៥០ °F) with magnesium forms finely divided beryllium, and additional heating to ១៣០០ °C (២៣៧០ °F) creates the compact metal. Heating beryllium hydroxide forms the oxide, which becomes beryllium chloride when combined with carbon and chlorine. Electrolysis of molten beryllium chloride is then used to obtain the metal. Beryllium's chemical behavior is largely a result of its small atomic and ionic radii. It thus has very high ionization potentials and strong polarization while bonded to other atoms, which is why all of its compounds are covalent. It is more chemically similar to aluminium than its close neighbors in the periodic table due to having a similar charge-to-radius ratio. An oxide layer forms around beryllium that prevents further reactions with air unless heated above 1000 °C. Once ignited, beryllium burns brilliantly forming a mixture of beryllium oxide and beryllium nitride. Beryllium dissolves readily in non-oxidizing acids, such as HCl and diluted H2SO4, but not in nitric acid or water as this forms the oxide. This behavior is similar to that of aluminium metal. Beryllium also dissolves in alkali solutions. The beryllium atom has the electronic configuration [He] 2s2. The two valence electrons give beryllium a +2 oxidation state and thus the ability to form two covalent bonds; the only evidence of lower valence of beryllium is in the solubility of the metal in BeCl2. Due to the octet rule, atoms tend to seek a valence of 8 in order to resemble a noble gas. Beryllium tries to achieve a coordination number of 4 because its two covalent bonds fill half of this octet. Tetracoordination allows beryllium compounds, such as the fluoride or chloride, to form polymers. Solutions of beryllium salts, e.g. beryllium sulfate and beryllium nitrate, are acidic because of hydrolysis of the [Be(H2O)4]2+ ion. Other products of hydrolysis include the trimeric ion [Be3(OH)3(H2O)6]3+. Beryllium hydroxide, Be(OH)2, is insoluble even in acidic solutions with pH less than 6, that is at biological pH. It is amphoteric and dissolves in strongly alkaline solutions. Beryllium forms binary compounds with many non-metals. Anhydrous halides are known for F, Cl, Br and I. BeF2 has a silica-like structure with corner-shared BeF4 tetrahedra. BeCl2 and BeBr2 have chain structures with edge-shared tetrahedra. All beryllium halides have a linear monomeric molecular structure in the gas phase. Beryllium difluoride, BeF2, is different than the other difluorides. In general, beryllium has a tendency to bond covalently, much more so than the other alkaline earths and its fluoride is partially covalent (although still more ionic than its other halides). BeF2 has many similarities to SiO2 (quartz) a mostly covalently bonded network solid. BeF2 has tetrahedrally coordinated metal and forms glasses (is difficult to crystallize). When crystalline, beryllium fluoride has the same room temperature crystal structure as quartz and shares many higher temperature structures also. Beryllium difluoride is very soluble in water, unlike the other alkaline earth difluorides. (Although they are strongly ionic, they do not dissolve because of the especially strong lattice energy of the fluorite structure.) However, BeF2 has much lower electrical conductivity when in solution or when molten than would be expected if it were fully ionic. Beryllium oxide, BeO, is a white refractory solid, which has the wurtzite crystal structure and a thermal conductivity as high as in some metals. BeO is amphoteric. Salts of beryllium can be produced by treating Be(OH)2 with acid. Beryllium sulfide, selenide and telluride are known, all having the zincblende structure. Beryllium nitride, Be3N2 is a high-melting-point compound which is readily hydrolyzed. Beryllium azide, BeN6 is known and beryllium phosphide, Be3P2 has a similar structure to Be3N2. Basic beryllium nitrate and basic beryllium acetate have similar tetrahedral structures with four beryllium atoms coordinated to a central oxide ion. A number of beryllium borides are known, such as Be5B, Be4B, Be2B, BeB2, BeB6 and BeB12. Beryllium carbide, Be2C, is a refractory brick-red compound that reacts with water to give methane. No beryllium silicide has been identified. The mineral beryl, which contains beryllium, has been used at least since the Ptolemaic dynasty of Egypt. In the first century CE, Roman naturalist Pliny the Elder mentioned in his encyclopedia Natural History that beryl and emerald ("smaragdus") were similar. The Papyrus Graecus Holmiensis, written in the third or fourth century CE, contains notes on how to prepare artificial emerald and beryl. Early analyses of emeralds and beryls by Martin Heinrich Klaproth, Torbern Olof Bergman, Franz Karl Achard, and Johann Jakob Bindheim always yielded similar elements, leading to the fallacious conclusion that both substances are aluminium silicates. Mineralogist René Just Haüy discovered that both crystals are geometrically identical, and he asked chemist Louis-Nicolas Vauquelin for a chemical analysis. In a 1798 paper read before the Institut de France, Vauquelin reported that he found a new "earth" by dissolving aluminium hydroxide from emerald and beryl in an additional alkali. The editors of the journal Annales de Chimie et de Physique named the new earth "glucine" for the sweet taste of some of its compounds. Klaproth preferred the name "beryllina" due to the fact that yttria also formed sweet salts. The name "beryllium" was first used by Wöhler in 1828. Using an alcohol lamp, Wöhler heated alternating layers of beryllium chloride and potassium in a wired-shut platinum crucible. The above reaction immediately took place and caused the crucible to become white hot. Upon cooling and washing the resulting gray-black powder he saw that it was made of fine particles with a dark metallic luster. The highly reactive potassium had been produced by the electrolysis of its compounds, a process discovered 21 years before. The chemical method using potassium yielded only small grains of beryllium from which no ingot of metal could be cast or hammered. The direct electrolysis of a molten mixture of beryllium fluoride and sodium fluoride by Paul Lebeau in 1898 resulted in the first pure (99.5 to 99.8%) samples of beryllium. The first commercially successful process for producing beryllium was developed in 1932 by Alfred Stock and Hans Goldschmidt. Their process involves the electrolysis of a mixture of beryllium fluorides and barium, which causes molten beryllium to collect on a water-cooled iron cathode. A sample of beryllium was bombarded with alpha rays from the decay of radium in a 1932 experiment by James Chadwick that uncovered the existence of the neutron. This same method is used in one class of radioisotope-based laboratory neutron sources that produce 30 neutrons for every million α particles. Beryllium production saw a rapid increase during World War II, due to the rising demand for hard beryllium-copper alloys and phosphors for fluorescent lights. Most early fluorescent lamps used zinc orthosilicate with varying content of beryllium to emit greenish light. Small additions of magnesium tungstate improved the blue part of the spectrum to yield an acceptable white light. Halophosphate-based phosphors replaced beryllium-based phosphors after beryllium was found to be toxic. Electrolysis of a mixture of beryllium fluoride and sodium fluoride was used to isolate beryllium during the 19th century. The metal's high melting point makes this process more energy-consuming than corresponding processes used for the alkali metals. Early in the 20th century, the production of beryllium by the thermal decomposition of beryllium iodide was investigated following the success of a similar process for the production of zirconium, but this process proved to be uneconomical for volume production. Pure beryllium metal did not become readily available until 1957, even though it had been used as an alloying metal to harden and toughen copper much earlier. Beryllium could be produced by reducing beryllium compounds such as beryllium chloride with metallic potassium or sodium. Currently most beryllium is produced by reducing beryllium fluoride with purified magnesium. The price on the American market for vacuum-cast beryllium ingots was about $338 per pound ($745 per kilogram) in 2001. Between 1998 and 2008, the world's production of beryllium had decreased from 343 to about 200 tonnes, of which 176 tonnes (88%) came from the United States. Early precursors of the word beryllium can be traced to many languages, including Latin Beryllus; French Béry; Greek βήρυλλος, bērullos, beryl; Prakrit veruliya (वॆरुलिय‌); Pāli veḷuriya (वेलुरिय), veḷiru (भेलिरु) or viḷar (भिलर्) – "to become pale", in reference to the pale semiprecious gemstone beryl. The original source is probably the Sanskrit word वैडूर्य (vaidurya), which is of Dravidian origin and could be related to the name of the modern city of Belur. For about 160 years, beryllium was also known as glucinum or glucinium (with the accompanying chemical symbol "Gl", or "G" ), the name coming from the Greek word for sweet: γλυκυς, due to the sweet taste of beryllium salts. Mixing about 2.0% beryllium into copper forms an alloy called beryllium copper that is six times stronger than copper alone. Beryllium alloys are used in many applications because of their combination of elasticity, high electrical conductivity and thermal conductivity, high strength and hardness, nonmagnetic properties, as well as good corrosion and fatigue resistance. These applications include non-sparking tools that are used near flammable gases (beryllium nickel), in springs and membranes (beryllium nickel and beryllium iron) used in surgical instruments and high temperature devices. As little as 50 parts per million of beryllium alloyed with liquid magnesium leads to a significant increase in oxidation resistance and decrease in flammability. Thin plates or foils of beryllium are sometimes used in nuclear weapon designs as the very outer layer of the plutonium pits in the primary stages of thermonuclear bombs, placed to surround the fissile material. These layers of beryllium are good "pushers" for the implosion of the plutonium-239, and they are also good neutron reflectors, just as they are in beryllium-moderated nuclear reactors. Beryllium is a health and safety issue for workers. Exposure to beryllium in the workplace can lead to a sensitization immune response and can over time develop chronic beryllium disease (CBD). The National Institute for Occupational Safety and Health (NIOSH) in the United States researches these effects in collaboration with a major manufacturer of beryllium products. The goal of this research is to prevent sensitization and CBD by developing a better understanding of the work processes and exposures that may present a potential risk for workers, and to develop effective interventions that will reduce the risk for adverse health effects. NIOSH also conducts genetic research on sensitization and CBD, independently of this collaboration. The NIOSH Manual of Analytical Methods contains methods for measuring occupational exposures to beryllium. Approximately 35 micrograms of beryllium is found in the average human body, an amount not considered harmful. Beryllium is chemically similar to magnesium and therefore can displace it from enzymes, which causes them to malfunction. Because Be2+ is a highly charged and small ion, it can easily get into many tissues and cells, where it specifically targets cell nuclei, inhibiting many enzymes, including those used for synthesizing DNA. Its toxicity is exacerbated by the fact that the body has no means to control beryllium levels, and once inside the body the beryllium cannot be removed. Chronic berylliosis is a pulmonary and systemic granulomatous disease caused by inhalation of dust or fumes contaminated with beryllium; either large amounts over a short time or small amounts over a long time can lead to this ailment. Symptoms of the disease can take up to five years to develop; about a third of patients with it die and the survivors are left disabled. The International Agency for Research on Cancer (IARC) lists beryllium and beryllium compounds as Category 1 carcinogens. In the US, the Occupational Safety and Health Administration (OSHA) has designated a permissible exposure limit (PEL) in the workplace with a time-weighted average (TWA) 0.002 mg/m3 and a constant exposure limit of 0.005 mg/m3 over 30 minutes, with a maximum peak limit of 0.025 mg/m3. The National Institute for Occupational Safety and Health (NIOSH) has set a recommended exposure limit (REL) of constant 0.0005 mg/m3. The IDLH (immediately dangerous to life and health) value is 4 mg/m3. The toxicity of finely divided beryllium (dust or powder, mainly encountered in industrial settings where beryllium is produced or machined) is very well-documented. Solid beryllium metal does not carry the same hazards as airborne inhaled dust, but any hazard associated with physical contact is poorly documented. Workers handling finished beryllium pieces are routinely advised to handle them with gloves, both as a precaution and because many if not most applications of beryllium cannot tolerate residue of skin contact such as fingerprints. Acute beryllium disease in the form of chemical pneumonitis was first reported in Europe in 1933 and in the United States in 1943. A survey found that about 5% of workers in plants manufacturing fluorescent lamps in 1949 in the United States had beryllium-related lung diseases. Chronic berylliosis resembles sarcoidosis in many respects, and the differential diagnosis is often difficult. It killed some early workers in nuclear weapons design, such as Herbert L. Anderson. Beryllium may be found in coal slag. When the slag is formulated into an abrasive agent for blasting paint and rust from hard surfaces, the beryllium can become airborne and become a source of exposure. Early researchers tasted beryllium and its various compounds for sweetness in order to verify its presence. Modern diagnostic equipment no longer necessitates this highly risky procedure and no attempt should be made to ingest this highly toxic substance. Beryllium and its compounds should be handled with great care and special precautions must be taken when carrying out any activity which could result in the release of beryllium dust (lung cancer is a possible result of prolonged exposure to beryllium-laden dust). Although the use of beryllium compounds in fluorescent lighting tubes was discontinued in 1949, potential for exposure to beryllium exists in the nuclear and aerospace industries and in the refining of beryllium metal and melting of beryllium-containing alloys, the manufacturing of electronic devices, and the handling of other beryllium-containing material. A successful test for beryllium in air and on surfaces has been recently developed and published as an international voluntary consensus standard ASTM D7202. The procedure uses dilute ammonium bifluoride for dissolution and fluorescence detection with beryllium bound to sulfonated hydroxybenzoquinoline, allowing up to 100 times more sensitive detection than the recommended limit for beryllium concentration in the workplace. Fluorescence increases with increasing beryllium concentration. The new procedure has been successfully tested on a variety of surfaces and is effective for the dissolution and ultratrace detection of refractory beryllium oxide and siliceous beryllium (ASTM D7458). ↑ ៨,០ ៨,១ Emsley 2001, p. 56. ↑ ១៨,០ ១៨,១ ១៨,២ Emsley 2001, p. 59. ↑ ២៤,០ ២៤,១ ២៤,២ ២៤,៣ ២៤,៤ ២៤,៥ ២៤,៦ ២៤,៧ ២៤,៨ Emsley 2001, p. 58. ↑ Mackay, Mackay & Henderson 2002, p. 243–244. ↑ ៣៥,០ ៣៥,១ Weeks 1968, p. 535. ↑ ៣៦,០ ៣៦,១ Weeks 1968, p. 536. ↑ Weeks 1968, p. 537. ↑ Weeks 1968, p. 538. ↑ ៤៥,០ ៤៥,១ ៤៥,២ Weeks 1968, p. 539. ↑ ៩០,០ ៩០,១ ៩០,២ Emsley 2001, p. 57. ↑ Emsley 2001, p. 5.